I usually make paleo egg cups on Sunday for the week. But I started to miss my all-time favorite over-easy eggs. I remember when I was little, I loved watching my mom poke into her over-easy egg with the point of her toast. Velvety yolk ran out and coated the crusty toast. But we don’t have toast in this house. Then a few months ago I saw on Pinterest sweet potato toast. Just slice up a sweet potato and put it in a toaster. This seemed too good to be true. I tried the toaster method and it was ok but I thought the oven might be a better approach. Also I can add bacon. I like to get a nice fat, long sweet potato. Scrub it real good and slice it lengthwise. You want nice thin slices. A sharp knife makes this job super easy. Then, grab a sheet pan. Cover it with foil or parchment paper for easy clean up. Add a few slices of bacon and the sweet potato toast. I add a little drizzle of oil and some seasoned pepper to my sweet potato. Here is the key! Put it in the cold oven. Then turn the heat to 400 degrees. Set the timer for 20 minutes. If you put the sheet pan into the oven before it preheats, it keeps the bacon for curling too much! After 20 minutes check to see if the bacon is cooked to your liking. Want it a little crispier? Put it back in for a few minutes. If your sweet potato toast is sliced thicker then you will need to keep those in the oven up to about 25 minutes (this is why we want nice thin slices!). We eat the bacon that morning but with the leftover sweet potato toasts we just keep those in the refrigerator to eat throughout the week. I warm them by frying them up in the same pan I make the eggs in. Done! Savory, paleo breakfast for the week! Place sheet pan into the cold oven. Set the timer to 400 degrees F and set the timer to 20 minutes. After 20 minutes check to see if the bacon is to your preference. For crispier bacon keep it in for another 2-3 minutes. 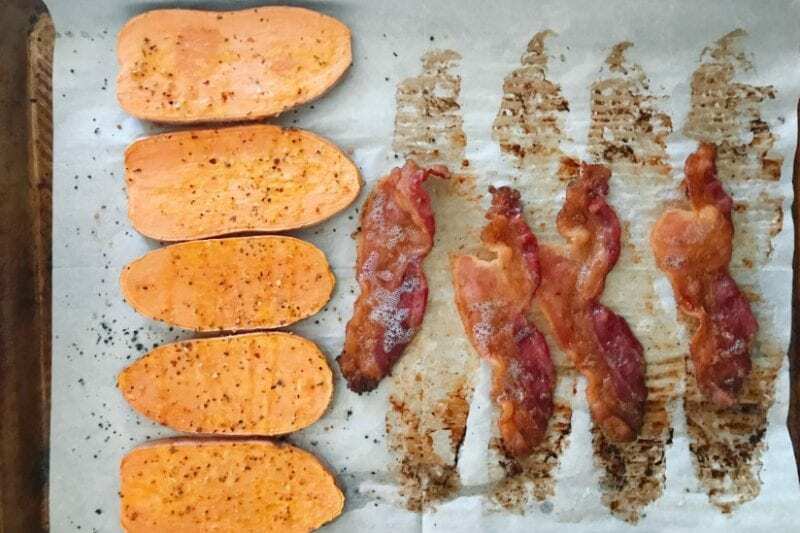 If your sweet potato toast slices are thick, remove bacon and let the slices continue to cook for another 5 minutes. Serve eggs over toast with bacon. For leftover toasts, store them in the refrigerator for up to one week. Reheat in the morning in a microwave or fry pan.